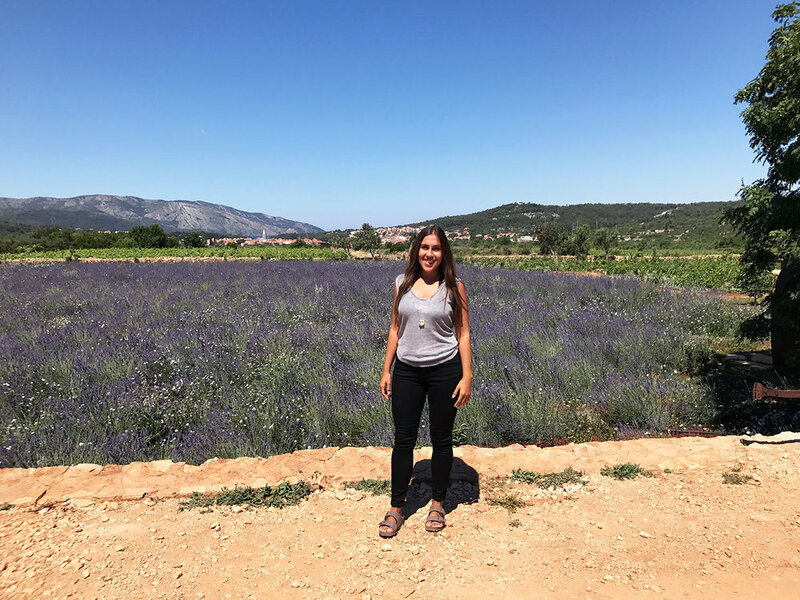 Wine Tasting in Hvar, Croatia Two Thousand Years in the Making — Sapphire & Elm Travel Co.
On an island out in the Adriatic Sea, between the port towns of Hvar, Stari Grad and Jesla, lies an open, expansive field of grass, vineyards, crops and homes. Lavender and olive trees grow on the side of the road next to stone villages thousands of years old. Exploring Hvar by scooter was one of the most freeing feelings; beach hopping, drinking beers with an ocean view, and sunset views from mountain tops. Hvar is an island on the Dalmatian coast of Croatia rich in culture, tradition and natural beauty. Stari Grad Plain is the most fertile and largest cultivated field on all the Mediterranean islands, where farming practices having continued without interruption for roughly 2,400 years. The area of Stari Grad Plain is just over 1377 hectares or 3,400 acres. First colonized by Ionian Greeks from Paros in the 4th century BC, Stari Grad Plain represents a comprehensive system of land use and agricultural. Primary crops were olives and grapes for wine, which still exist today. Despite changing landscapes around it, the Stari Grad Plain has remained relatively unchanged for twenty four centuries, representing a successful and sustainable solution of agriculture, coupled with immense beauty. For it’s long history and preservation of tradition, Stari Grad Plain was announced as a UNESCO World Heritage site in 2008. The agricultural plain of Stari Grad is an example of very ancient traditional human settlement, which is today under threat from modern economic development, particularly from rural depopulation and the abandonment of traditional farming practices. While on scooter, I was doing some reconnaissance of a unique wine and culinary experience in Stari Grad Plain called Hora. As you probably know by now, here at Sapphire & Elm Travel we love food and wine tasting. Food and wine combines history, tradition, culture and decadence often in an outdoor setting. My time at Hora was nothing short of astounding. A world away from the beaches and coastal towns on Hvar, the Zuvela family are continuing the traditions of the Ancient Greeks today at Hora. 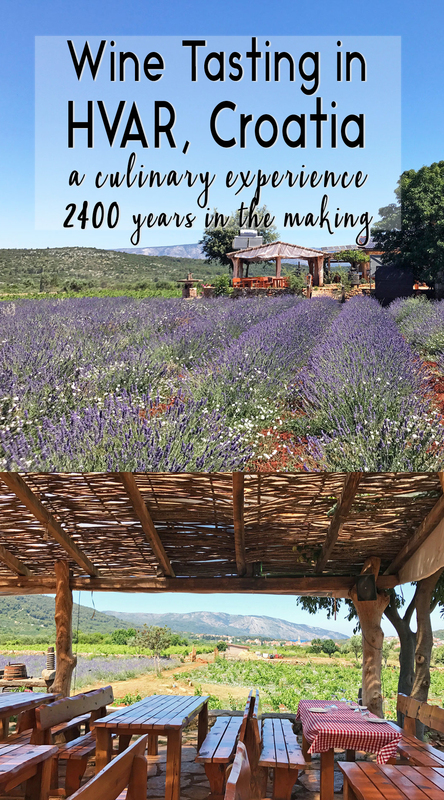 An oasis for animals, organic produce and wine, taking you back some 2400 years with a food and wine pairing displaying the most traditional Dalmatian foods. At Hora, I was given a very warm welcome and since I was quite early, they gave me a tour around the property while they finished preparing my meal. Once I sat at my lovely table with incredible views of the vineyards, lavender fields and even the ocean and port town of Stari Grad in the distance. I was given a 3 course meal paired with their delicious wine. Did you know: the Zinfandel grape originates in Croatia? Food included three types of organic olive oil tasting, anchovies, salami, goat and sheep cheeses and zucchini to start. The main course was peka, a traditional meat, potatoes, zucchini, onion and spices dish cooked for several hours in an iron pot, a light salad, and then finished with desert. It is possible to wine taste here without the food pairing. If you do have the meal, you must book a day in advance as the peka takes many, many hours to prepare. The closest town to Hora is Stari Grad. I came from the main town of Hvar by taxi, however it is also possible to rent a scooter (if your comfortable) or an ATV for the day to explore the island and stop here for lunch, dinner or wine tasting. It was quite difficult to find on my own, and was thankful my cab driver knew where it was. This agro tourism spot in Hvar is certainly an experience not to be missed. After almost a week in Dubrovnik, I took a ferry to the island of Hvar. During peak season (summer) there are many options for ferries leaving a couple times a day and ranging in speed. It took me roughly 3 hours to get from Dubrovnik to Hvar, but I left beginning of June before "peak season". I spent 4 nights in the main town of Hvar and took a cab to Hora. After my wine tasting and food pairing experience, I took another cab to the port of Stari Grad and took a 2 hour ferry to Split. Lunch of Peka and salad paired with red wine. Dessert of Dough and Berries Paired with rose. Contact us to plan your trip to the islands of Croatia and beyond.